Outdenting a task moves it up a level in the outline (literally shifting it to the left in the outline). When outdented, a task is moved to a higher level of detail; in other words, it’s less detailed. Indenting a task moves it down a level in the outline (literally indenting the task to the right in the outline) and puts it at a deeper level of detail. Whenever you indent one or more tasks, the task above becomes the summary task. You use tools from the Schedule group on the Task tab of the Ribbon, to outdent and indent tasks in a project outline. 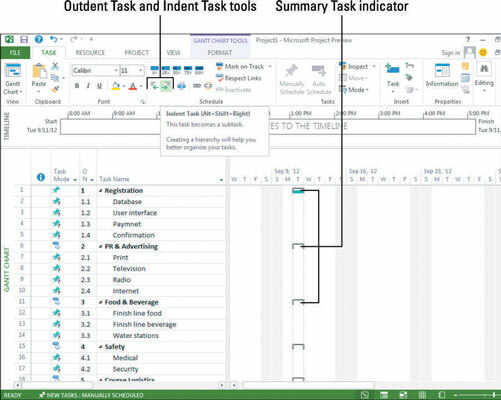 The Outdent Task tool has a left-facing arrow; the Indent Task tool has a right-facing arrow. Click a task in a columnar view to select it. Click the Outdent Tasks or Indent Tasks button, according to the action you want to take. You can build the outline even faster by indenting multiple tasks at a time. Drag to select multiple task IDs and then indent them. You can also use the standard Shift+click and Ctrl+click selection methods to select multiple tasks in a Project outline. Shift+click the task IDs to select contiguous tasks, and Ctrl+click to select discrete tasks. You can indent using keystrokes by pressing Alt+Shift+right arrow. You can outdent using keystrokes by pressing Alt+Shift+left arrow.